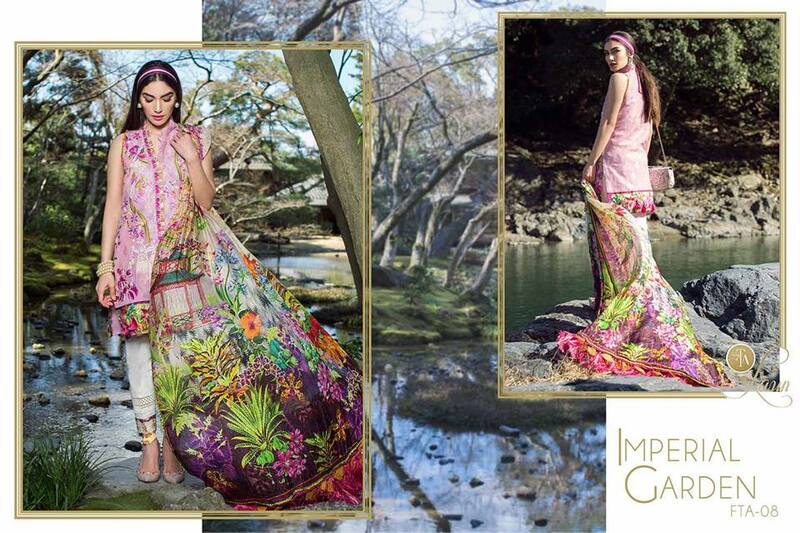 Fashion equinox is here to dazzle us all with the inspiring new lawn designs. 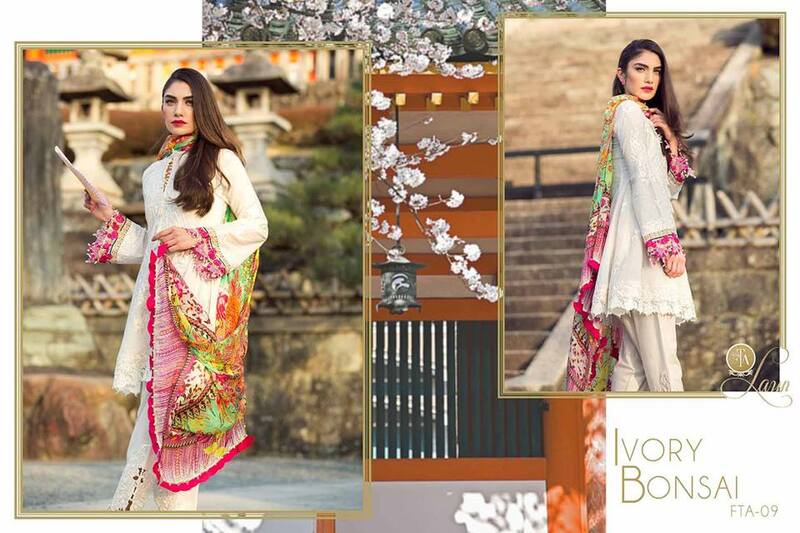 This year, all the style catalogues will take you by surprise with the immense variety of colorful prints, novel patterns, prominent embroideries and quintessential designs. As the summer is on the move we all look for a lawn that doesn’t bring style to us but the one which is equally reliable, unique and comfy to carry around. From the pret collection to the unstitched ones, the big names of the fashion industry has set out to bring the best of the stuff to the market while maintaining the distinction of their own. Though there are many great clothing lines, which have recently launched number of their lawn collections, today, we are about to the unveil the most mesmerizing Pakistani Lawn Brands Designer Dresses collections by the top ten brands of Pakistan. There are many names on the list, you might already be familiar with like the famous Elan, Asim Jofa, Cross Stitch, Rungrez etc. Along with these, there are other names which have made their mark in the industry over the past few years with their fine and quality work. Without any other further a due, let’s jump ahead and discover the latest Pakistani Lawn Brands Designer Dresses Collections for the year 2018. Be it casual or formal wear, we have it all to set up your mood with refreshing summer colors and blossoming floral patterns. 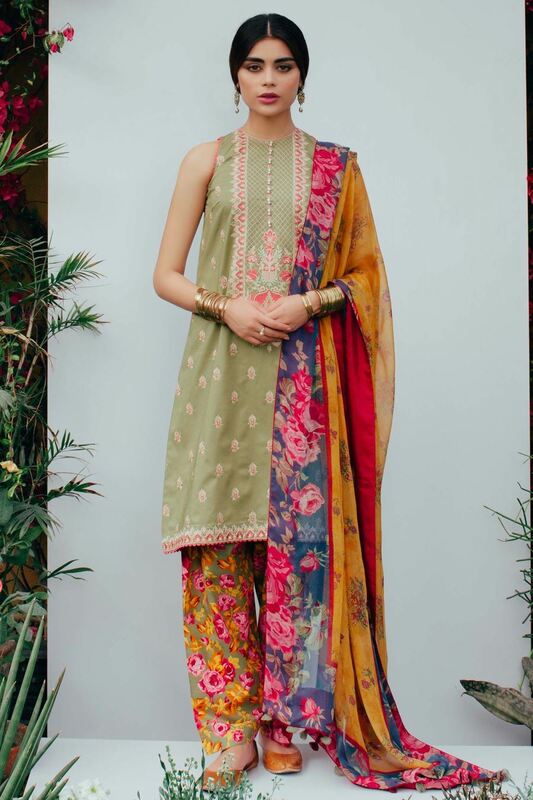 This year, élan is presented a diverse collection of unstitched Lawn suits which the classic prints highlighted in the contrasts of fresh colors. White is kept central for all of its suits, whether its teal, mustard, black or pink, all such hues are paired with some form of white. And no doubt with the addition of white these suits are getting a refreshing vibe. Moving to the prints of the dresses, the designers have made an excellent use of classic block patterns and cross stitch prints, more heavily focus around the shirt’s borders, sleeves while balancing it out monochromatic simple white trousers or lightly printed necklines. Along with archetypal floral prints, these dresses also offers you the range of nice digital prints, few of them are even highlighted with some skyline patterns or traditional architectural motifs. The fascinating element incorporated into the line is the addition of vertical sideline decent patterns over the bottoms. This pattern perfectly complements the intricate patterns of the dupatta and the bordered prints of the shirt. Though FTA is famous for its exquisite and mesmerizing silk collection, which the brand launches every year with new opulence and exuberance. 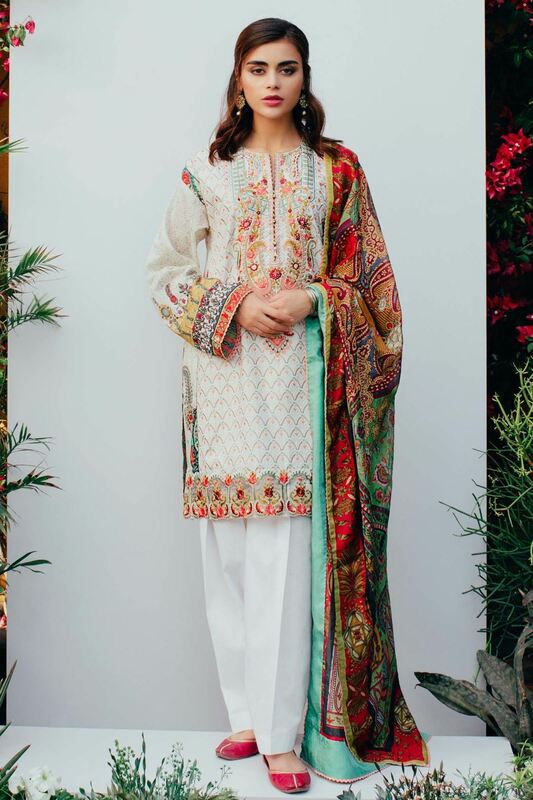 This year, Farah’s lawn collection looks equally exotic. She infused a fine artistry into each piece of apparel. The designs are reflecting the floral landscape which is perfect to carry around during hot summer days. Soft and pale colors including pastel pink, peach, and move. The selection of the right palette makes this collection more effeminate. The patterns are integrated together in a variety of shades which amalgamates to generate an eye captivating design. Though dupatta and lawn shirts are heavily printed the bottoms are there to balance things out. The bottom’s shades are perfect to keep up the lighter tone not just through its Sufi’stic white but also through mild shades of pink and blues. 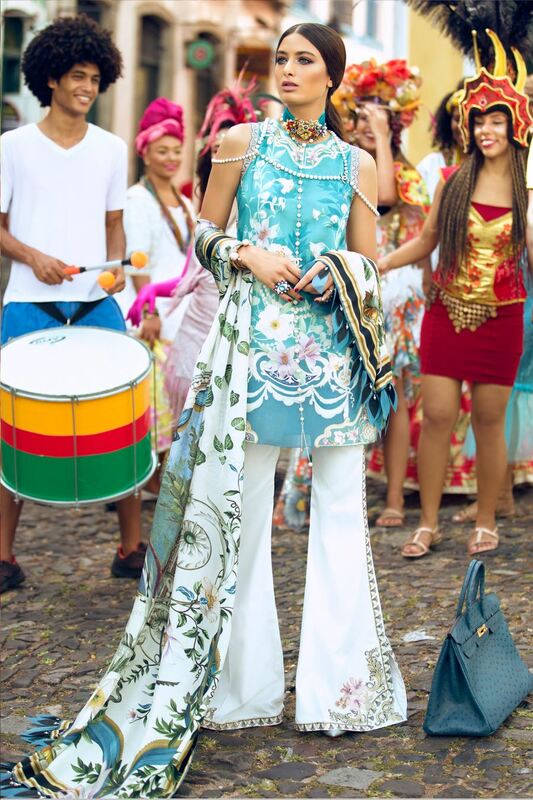 Époque X has indeed come up with a lot more beauty and style that we all anticipated. Suffuse is the name of excellence and uniqueness is its trademark. 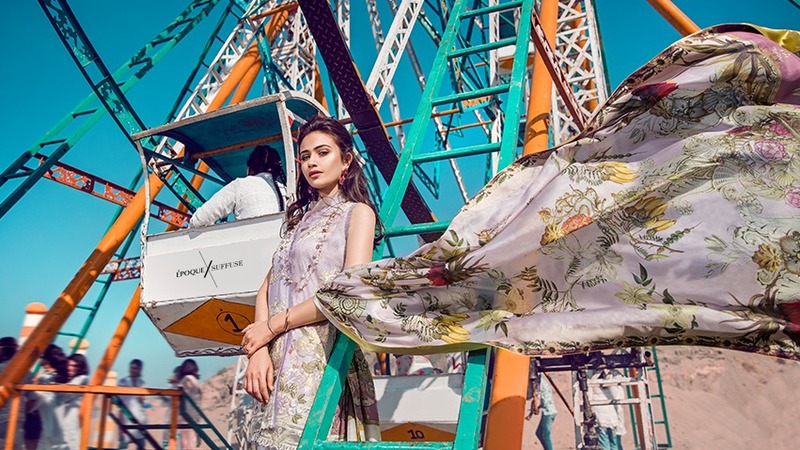 The brand recently launched its latest lawn catalogue in which gorgeous Sana Javed is seen adorned with the inspiring dresses and refreshing new prints. The dresses are style and patterned to create a soothing blend for the summer days and evenings. 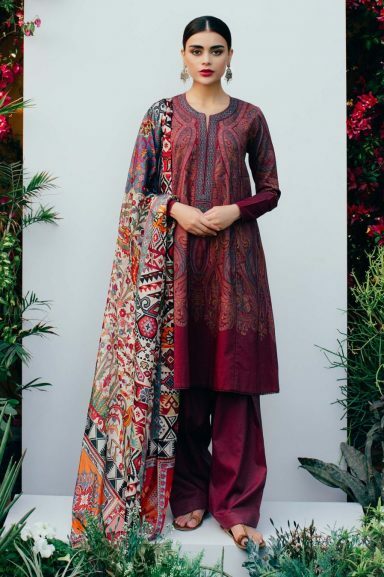 For both the formal and casual wears, the suits will suffice as their prints are not funky and vibrant but soft and elegant, as per the latest trends of the ongoing fashion in Pakistan. Keeping the trends in mind, the designer at Suffuse created prints which look amazing when crafted and stitched using modern cuts. So if you are opting for the dresses, it is best to get some trendy shirts and curvy bottoms stitched out of the entire suit. Imagine the diversity of their recent Lawn collection with the names of styles the catalogue is divided into, it ranges from the “medley of lines” to the “Mughal backyard” with the exotic collections of “flowers and stamps” and “frames”. Each piece of apparel falling in these categories is entirely unique from its other counterparts. In the medley of lines, the major focus is kept on prominent patterns with intricate lines, which are paired with bold and fresh floral embroideries. The embroideries for these dresses are simply there to sophisticate the dresses with the touch of applique and threadwork. There are just a few more days left to see this exclusive collection available in the stores. The expected date of launch is April 10th and onwards, so mark your calendars and plan ahead to design these unstitched beauties into something quintessential. “Be yourself. 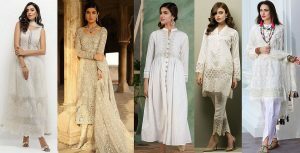 Wear your history, your personality”, Keeping this slogan in mind, Zara Shahjahan has always chosen the beautiful Pakistani vintage to diffuse into every piece of their apparels. From bridals to luxury pret the brand encompasses all the varieties and designs, whereas their lawn collections are absolutely mesmerizing. The prints are distinct in style and due to the soft palette. Shirts are designed with bordered patterns which beautifully surrounds the central region and the printed neckline. These single file patterns complement and balance out the dupatta. The trousers are however simple and most of them are bordered with some fine lacework or delicate crochet work around the ankles. What adds more elegance to the suits are the decent thread embroideries in silver, more beige, ivory and other fascinating colors. As the name tells it, the brand itself stands out for lovely colors inspired by nature. Keeping the tradition in place, this year too Rungrez set up the motion of fascinating colors into the right direction. It looks like the spring is on rising with the soft breeze in the air. Their unstitched collection is embroidered with fine and intricate patterns. From the fronts of the shirts to the dupattas, the thread work is also paired with floral applique work. The base colors of the suits are softest of all and monochromatic in theme, the same color follows the entire length of the suit including the dupatta and the bottom. However, shirts are lightly printed and embroidered as well. For formal wear, the dupattas are crafted as well with the embroideries whereas other are simply printed. Leon and Salamanca are the two best selections of this collection. Saira Rizwan always incorporates diverse color palette into her casual and formal collections. Moreover, every piece of apparel looks like a perfect portrait of a rich cultural landscape. This also happens to be true for her latest Lawn Collection 2018, which is so diverse in colors and forms. With the prominent prints, visible contrasts and fine embroideries the collection has already won the hearts of many in the fashion circles. The entire palette ranges from the funkiest hues in town to the pale and pastel ones. The defining feature of this collection is the modern cuts which are equally shared by all the dresses. These cuts are highlighted with special patterns and modern artistry. Refreshing pieces like Rosa, Maha and Kesel need an especial mention here due to the ultra-opulence they carry. The luxurious lawn collection ’18 by Shiza Hassan has the fashion catalogues and soon will inspire us all with the depth and beauty of the dresses being crafted with vibrant prints and vivid colors. The elegance is kept central to all. ‘Toile’ is a piece portraying good blues and charms of the open waters. For scorching summers it is one good option to go for. Whereas the ‘gemstones’ has a soft tone and embossed embroideries highlighting the entire neckline. The sleeve is designed with darker shades of brown which is balancing the shades of its chiffon dupatta. There many other magnificent pieces to take your breath away, like the one in the pistachio, ‘Serene’ in blue and many others to mention here. Perhaps the entire collection is enough to meet your wardrobe needs for the entire season. Asim Jofa’s lawn collection stands out from the rest due to the unique embroideries and the effeminate floral work it is adorned with. 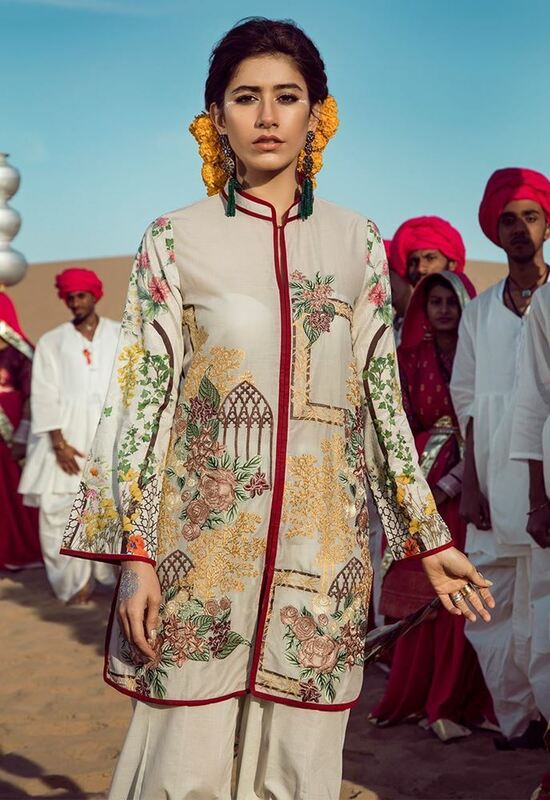 The most exclusive of all these suits are the intricately embroidered dupattas which reflect the most colors through the thread work and detailed floral patterns. Here the shirts and the trousers are designed with monochromatic hues with prominent embroideries and highly contrasting dupattas. Block printed trousers are garnering much of the appraisals due to the unique outlook they have. If you haven’t seen the stunning Saira Shehroz flaunting in the minimalistic style Cross stitch lawn collection then here is your chance to take a peak. All of its dresses are the next level portrayal of beautiful digital prints mixed with basic hues and simplistic patterns. Some are designed with the archetypal prints of the historical architecture whereas others are the mix of feminine floral prints. The diverse palette lets you chose a couture for every occasion and celebration without going through much of the thinking.